Established in 2005 in London’s “Square Mile”, ActivTrades is an UK regulated forex brokerage which has geared its offering very much toward the UK market since its inception. This is apparent in the company’s website wording where “Spread Betting”, a term used in the United Kingdom in order to for traders withdraw their profits without tax liability due to its classification as gambling rather than trading, is prevalent. The company extended its service to support MetaTrader 5 in March last year, and has enjoyed successful acquisition of clients in Europe recently, including their presence at Germany’s World of Trading Conference. 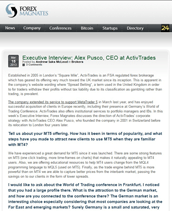 ActivTrades also offers institutional services to portfolio managers and IBs.